In honour of International Womens Day 2015, I am pleased to introduce Cranky Ladies of History, an anthology launched today from Fablecroft Publishing. Cranky Ladies of History is an anthology conceived and developed by Tehani Wessley of Fablecroft Publishing and author, Tansy Rayner Roberts. Crowdfunded through Pozible during Womens History Month in 2014, the concept attracted many supporters eager to be a part of project. 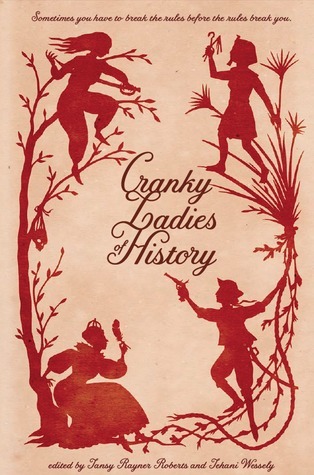 Twenty two authors have contributed to Cranky Ladies of History, including award winner’s Thoraiya Dyer, Juliet Marillier, Jane Yolen and Garth Nix. Each short story in Cranky Ladies of History features a real female historical figure. I’m not familiar enough with history to separate fact from fiction in these pieces but these strong, often fierce women are those who challenged society’s rules and ideas about how women should behave, though not always in heroic or noble ways. While Garth Nix honours Lady Godiva in ‘The Company of Women’, ‘Look How Cold My Hands Are’ by Deborah Biancotti features Countess Bathory, an insane serial killer. An entertaining and interesting anthology, Cranky Ladies of History is an important collection of fiction that gives voice to an extraordinary selection of women from a broad range of backgrounds, era’s and cultures. I wouldn’t hesitate to recommend it. Previous Review: Nothing Sacred by David Thorne Next It’s Monday! What Are You Reading?